Have You Killed Your Sacred Zombie Cow Today? I asked Hugh MacLeod to design this cube grenade for Orpreneur.com. Hugh’s cube grenade cartoons serve as conversation bombs, something with which to break a conceptual log jam and get things moving. I think this one is a great bomb for a lot of organizations. Please share this around, tape it to the wall, post it to your intranet, or slap it down on the table in your next staff meeting. Just don’t ignore those sacred zombie cows grazing in your hallways! You must kill your sacred zombie cow if you want your organization to survive and thrive. As Parker implicitly admitted in the interview, it is hard to stop making crap even if you already produce some of the best products in your industry. If it were easy Parker wouldn’t care about it. The problem with crap is that it is too easy to make. Crap keeps people busy. We’ve always made crap! But crap gets in the way of making the remarkable, the insanely valuable, the things for which you are the best. Thus the focus on editing at Nike. Enter the sacred zombie cow. 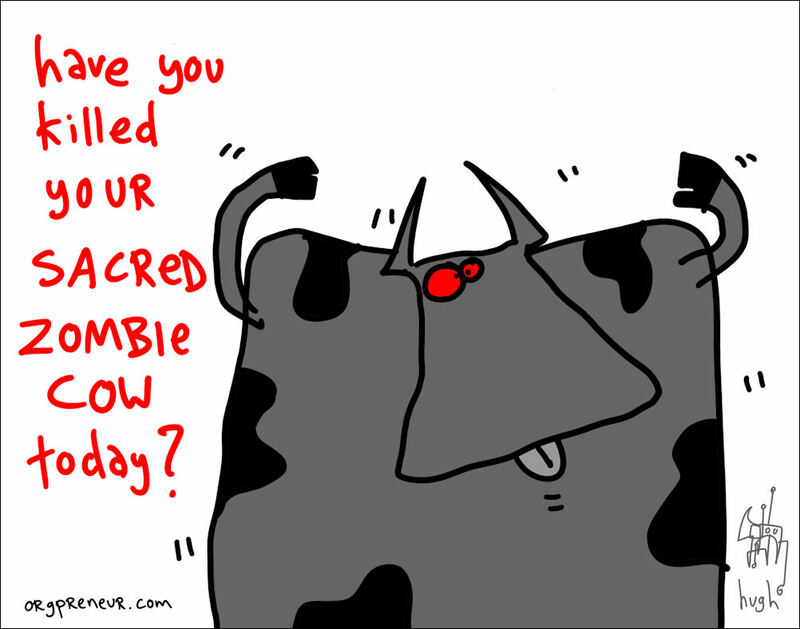 Sacred zombie cows are the purest manifestation of crap within an organization. These are programs, products and services that are a net negative to the company and yet are incredibly hard to kill. They no longer have a strong sponsor on the scene but still they shamble along, eating up resources. People tend to walk around sacred zombie cows like they are just a piece of furniture, ignoring how utterly dangerous they are. Peter Drucker, the godfather of business strategy, said that the most innovative companies are those that are ruthless about stopping things. They maniacally root out and destroy sacred zombie cows, like a Van Helsing in Dockers. Why are these highly innovative companies so focused on the art of the stop? Because it frees up resources that can be invested to develop new products, services and programs. Innovation solely through growth is inherently unsustainable. At some point all organizations hit a plateau. Those that never bothered to learn how to stop something go from radical growth to radical stagnation. If you’ve been editing out the sacred zombie cows all along, then the chances of hitting a plateau are less and when you do hit one you have the ability to change at the precise moment that you need to. Find your sacred zombie cow. Turn around, it’s right behind you. Now drive a stake through its heart. Or defenestrate it. Or give it away to another company! Do what you must to get it out and gone forever. Even if you are the one who turned it loose in the first place. Killing sacred zombie cows is an act of optimism. It frees your organization to focus on excellence. More personally, it just might unleash a creative burst that takes you to a new level of achievement.